Many emerging infectious diseases are caused by generalist pathogens that infect and transmit via multiple host species with multiple dissemination routes, thus confounding the understanding of pathogen transmission pathways from wildlife reservoirs to humans. 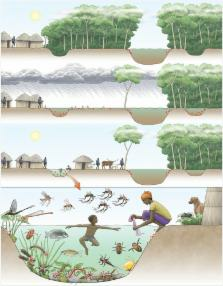 The emergence of these pathogens in human populations has frequently been associated with global changes, such as socio-economic, climate or biodiversity modifications, by allowing generalist pathogens to invade and persist in new ecological niches, infect new host species, and thus change the nature of transmission pathways. Using the case of Buruli ulcer disease, we review how land-use changes, climatic patterns and biodiversity alterations contribute to disease emergence in many parts of the world. Here we clearly show that Mycobacterium ulcerans is an environmental pathogen characterized by multi-host transmission dynamics and that its infectious pathways to humans rely on the local effects of global environmental changes. We show that the interplay between habitat changes (for example, deforestation and agricultural land-use changes) and climatic patterns (for example, rainfall events), applied in a local context, can lead to abiotic environmental changes and functional changes in local biodiversity that favor the pathogen's prevalence in the environment and may explain disease emergence. Emerging infectious diseases (EIDs) of free-living wild animals can be classified into three major groups on the basis of key epizootiological criteria: (i) EIDs associated with "spill-over" from domestic animals to wildlife populations living in proximity; (ii) EIDs related directly to human intervention, via host or parasite translocations; and (iii) EIDs with no overt human or domestic animal involvement. These phenomena have two major biological implications: first, many wildlife species are reservoirs of pathogens that threaten domestic animal and human health; second, wildlife EIDs pose a substantial threat to the conservation of global biodiversity. The challenge of emerging and re-emerging infectious diseases. Infectious diseases have for centuries ranked with wars and famine as major challenges to human progress and survival. They remain among the leading causes of death and disability worldwide. Against a constant background of established infections, epidemics of new and old infectious diseases periodically emerge, greatly magnifying the global burden of infections. Studies of these emerging infections reveal the evolutionary properties of pathogenic microorganisms and the dynamic relationships between microorganisms, their hosts and the environment. A recent, comprehensive literature survey of human pathogens listed >1,400 different species ( 1 ), more than half known to be zoonotic, i.e., able to infect other host species ( 1 , 2 ). The survey data showed that those pathogens regarded as emerging and reemerging were more likely to be zoonotic than those that are not ( 1 , 3 ), confirming an association between these characteristics which had long been suspected ( 4 , 5 ), but which could not be formally demonstrated without denominator data as well as numerator data. Here, we revisit these calculations, using updated information on the biology and epidemiology of recognized human pathogens. We pay close attention to possible differences between the major pathogen groups—viruses, bacteria, fungi, protozoa, and helminths. We also examine in detail the relationship between host range and pathogen emergence or reemergence, considering both the type and diversity of nonhuman hosts. We catalog the kinds of proximate factors or drivers that have been linked with pathogen emergence and reemergence and ask whether these differ between the major pathogen groups or between zoonotic and nonzoonotic pathogens. We focus mainly on pathogen diversity (as numbers of species) rather than on the effects of disease that they impose, noting that many diseases, e.g., infant diarrhea, can be caused by more than one species of pathogen. However, we comment on the transmissibility of pathogens once they have been introduced into the human population because transmissibility is an important determinant of the potential public health problem. Methods We obtained counts of pathogen species from an updated version of the previously published database ( 1 ). As before, we defined a human pathogen as "a species infectious to and capable of causing disease in humans under natural transmission conditions." We included pathogens that have only been reported as causing a single case of human disease and those that only cause disease in immunocompromised persons. We also included instances of accidental laboratory infection but excluded infections resulting from deliberate exposure in the laboratory. We added recently recognized pathogens listed online by the Centers for Disease Control and Prevention, the World Health Organization (WHO), ProMED, and elsewhere ( 6 – 9 ). We obtained taxonomic classifications online from the International Committee on Taxonomy of Viruses, the National Centre for Biotechnology Information, the CAB International Bioscience database of fungal names, and from standard texts ( 10 – 15 ). Pathogen species were categorized as emerging or reemerging based on previously published reviews of the literature ( 1 , 3 ), again updated from online sources ( 6 – 8 ). A species was regarded as emerging or reemerging if any recognized variant fell into this category (e.g., Escherichia coli O157, H5N1 influenza A). We considered the following pathogen groups: viruses (including prions), bacteria (including rickettsia), fungi (including microsporidia), protozoa, and helminths. We did not consider ectoparasites (ticks and lice). Each group was further divided into subgroups (families) to test whether biases existed in numbers of emerging and reemerging species at this level. The viruses were also divided according to genome type (e.g., negative single-stranded RNA viruses). We examined 3 aspects of host range, both for all pathogens combined and separately for each of the viruses, bacteria, fungi, protozoa, and helminths. First, we distinguished pathogen species according to whether they were known to be zoonotic, using the WHO definition "diseases or infections which are naturally transmitted between vertebrate animals and humans" ( 16 ). Note that this definition includes pathogens for which humans are the main host and other vertebrates are only occasional hosts, as well as the opposite, but excludes purely human pathogens that recently evolved from nonhuman pathogens, e.g., HIV. We then compared the fraction of emerging or reemerging species that were or were not zoonotic across the major pathogen groups and within each group by family. Second, for all zoonotic species we identified the types of nonhuman vertebrate host they are known to infect, using the following broad categories: bats, carnivores, primates, rodents, ungulates, and other mammals and nonmammals (including birds, reptiles, amphibians, and fish). We excluded vertebrate intermediate hosts of parasites with complex life cycles. Host types were ranked by the number of zoonotic pathogen species associated with them, and rankings were compared by using Spearman rank correlation coefficient. Third, we obtained a crude index of the breadth of host range by counting the number of the host types that each pathogen species is known to infect: 0 (i.e., not zoonotic), 1, 2, and 3 or more. We compared the fraction of emerging and reemerging species across these 4 classes. For the emerging and reemerging pathogen species, we identified the main factors believed to drive their increased incidence, geographic range, or both, by conducting a systematic review of the emerging diseases literature. We allocated these drivers to 1 or more broad categories (Table). Note that although we chose categories that we considered to be useful and informative for our immediate purposes, and which were similar to those listed elsewhere ( 5 ), this is inevitably a subjective procedure and alternative categorizations may be equally valid. We then ranked the drivers (by number of emerging and reemerging pathogen species associated with each) and compared the ranking of drivers for the major pathogen groups and for zoonotic versus nonzoonotic pathogens. Table Main categories of drivers associated with emergence and reemergence of human pathogens Rank* Driver 1 Changes in land use or agricultural practices 2 Changes in human demographics and society 3 Poor population health (e.g., HIV, malnutrition) 4 Hospitals and medical procedures 5 Pathogen evolution (e.g., antimicrobial drug resistance, increased virulence) 6 Contamination of food sources or water supplies 7 International travel 8 Failure of public health programs 9 International trade 10 Climate change *Ranked by the number of pathogen species associated with them (most to least). For the zoonotic species, we distinguished those known to be transmissible between humans, allowing that this might be through an indirect route (e.g., a vector or an intermediate host), from those for which humans can only acquire infection (directly or indirectly) from a nonhuman source. For the transmissible zoonotic species, we further distinguished those that are sufficiently transmissible to cause major epidemics in human populations from those that cause only relatively minor outbreaks. This classification was intended to distinguish between pathogens with R 0>1 in humans from those with R 0 1 host. A) All zoonotic species. B) Emerging and reemerging zoonotic species only. However, when the fraction of emerging and reemerging species is compared with the breadth of host range (as the number of host types other than humans), a pattern becomes apparent (Figure 2). Overall, the fraction tends to increase with host range: >40% of pathogens with the broadest host ranges (3 or more types of nonhuman host) are emerging or reemerging (exact p = 0.042). However, this trend does not hold for the protozoa and helminths (although the numbers for these groups are small). Figure 2 Relationship between breadth of host range (as number of nonhuman host types, as listed in Figure 1) and the fraction of pathogen species regarded as emerging or reemerging. A total of 122 zoonotic species (10 of them emerging or reemerging) for which the host range is unknown are omitted. Drivers of Emergence We identified 10 main categories of drivers of emergence and reemergence and ranked these by the total number of pathogen species associated with them (Table). The ranking of drivers across different categories of pathogen showed poor concordance (e.g., Spearman rank correlation for bacteria vs. viruses, rs = 0.41, n = 10, p = 0.24). The most striking discrepancies were as follows: 1) the marked association of emerging or reemerging fungi with hospitalization, poor population health, or both; 2) the greater importance of pathogen evolution and contaminated food and water and the lesser importance of international travel and changes in land use and agriculture for bacteria in comparison with viruses; 3) the greater importance of changing land use and agriculture for zoonoses than for nonzoonoses. Transmissibility Overall, most zoonotic pathogens are either not transmissible (directly or indirectly) between humans at all (i.e., humans are a dead-end host) or are only minimally transmissible. Examples include rabies virus, Rift Valley fever virus, and Borrelia burgdorferi (the agent of Lyme disease). A small minority (≈10%) of pathogen species that are technically zoonotic are, in fact, spread almost exclusively from person to person (e.g., Mycobacterium tuberculosis or measles virus) or can do so once successfully introduced from a nonhuman source (e.g., some strains of influenza A, Yersinia pestis, or severe acute respiratory syndrome (SARS) coronavirus). However, a substantial minority of zoonotic pathogens (about 25%, i.e., 200 species) are capable of some person-to-person transmission but do not persist without repeated reintroductions from a nonhuman reservoir (e.g., E. coli O157, Trypanosoma brucei rhodesiense, or Ebola virus). This pattern is fairly consistent across the major pathogen groups. Discussion Humans are affected by an impressive diversity of pathogens; 1,407 pathogenic species of viruses, bacteria, fungi, protozoa, and helminths are currently recognized. Of this total, 177 (13%) pathogen species are considered emerging or reemerging. This number must be viewed with some caution, given that these terms are still used somewhat subjectively. More rigorous definitions of emerging and reemerging have been proposed ( 5 , 17 , 18 ), but these are difficult to apply universally because they require long-term data on distributions and incidences which are available for only a small subset of infectious diseases (e.g., malaria  and tuberculosis ). Moreover, the counts of emerging and reemerging pathogen species reported here are subject to ascertainment bias. Despite these caveats, our results suggest that pathogens associated with emerging and reemerging diseases share some common features. First, emerging and reemerging pathogens are disproportionately viruses, although they are not disproportionately different kinds of viruses. Numerically, RNA viruses dominate, comprising 37% of all emerging and reemerging pathogens. RNA viruses are also prominent among the subset of emerging pathogens that have apparently entered the human population only in the past few decades, such as HIV or the SARS coronavirus ( 21 , 22 ). A possible explanation for this observation is that much higher nucleotide substitution rates for RNA viruses permit more rapid adaptation, greatly increasing the chances of successfully invading a new host population ( 21 , 22 ). Second, emerging and reemerging pathogens are not strongly associated with particular nonhuman host types, although emerging and reemerging pathogens more often are those with broad host ranges that often encompass several mammalian orders and even nonmammals. This pattern is consistent across the major pathogen groups. The determinants of host range in general remain poorly understood, but among viruses for which the cell receptor is known, an association exists between host range and whether the receptor is phylogenetically conserved (as measured by the homology of the human and mouse amino acid sequences) ( 23 ). Emerging and reemerging pathogens have been likened to weeds ( 24 ), and that the associations reported above are likely reflecting underlying "weediness," that is, a degree of biologic flexibility that makes certain pathogens adept at taking advantage of new epidemiologic opportunities. This characteristic seems to be reflected in the broad range of drivers of the emergence or reemergence of pathogens, ranging from changes in land use and agriculture, through hospitalization to international travel. Although some drivers are numerically more important than others, the overall impression is that pathogens are exploiting almost any change in human ecology that provides new opportunities for transmission, either between humans or to humans from a nonhuman source. Even if a pathogen is capable of infecting and causing disease in humans, most zoonotic pathogens are not highly transmissible within human populations and do not cause major epidemics. The possible magnitude of an infectious disease outbreak is related to the basic reproduction number, R 0 (Figure 3). For pathogens that are minimally transmissible within human populations (R 0 close to 0), outbreak size is determined largely by the number of introductions from the reservoir. For pathogens that are highly transmissible within human populations (R 0>>1), outbreak size is determined largely by the size of the susceptible population. For pathogens that are moderately transmissible within human populations (corresponding to R 0 ≈ 1), notable outbreaks are possible (especially if multiple introductions occur), but the scale of these outbreaks is very sensitive to small changes in R 0. In other words, small changes in the nature of the host-pathogen interaction can lead to large increases (or decreases) in the scale of the public health problem (Figure 3). Such pathogens may be likely sources of emerging infectious disease problems in the future. However, we currently have no way of predicting whether a novel human pathogen will behave like rabies (frequently introduced into the human population, but not capable of causing major epidemics) or HIV (probably rarely introduced, but capable of causing a global pandemic). Figure 3 Expected relationship between outbreak size (as fraction of the population affected) and 2 key epidemiologic parameters: I0 is the number of primary cases of infection introduced into the human population from an external source such as a zoonotic reservoir (increasing in the direction indicated); R0 is the basic reproduction number, a measure of the transmissibility of the infection with the human population (see text). The curves are obtained from a modified version of the Kermack-McKendrick equation and show that expected outbreak size is particularly sensitive to small changes in I0 or R0 when R0 is close to 1. Examples of zoonotic pathogens with R0>1, R0<1 and R0 close to 1 are shown. RIVF, Rift Valley fever virus. (Reprinted with permission from ). In conclusion, this study suggests that biologic and epidemiologic correlates of pathogen emergence or reemergence may be identified. However, the most striking feature of emerging and reemerging pathogens is their diversity (Appendix). For this reason, surveillance and monitoring of infectious disease trends may have to be broadly targeted to be most effective. Given that three-fourths of emerging and reemerging pathogens are zoonotic, in many cases this targeting might usefully be extended beyond at-risk human populations to include populations of potential animal reservoirs.